Tooth brushing is indeed a vital daily activity for a good oral health. Besides that, tooth brushing protects the teeth against dental caries and it also helps prevent bad breath and gum disease. Gum disease is a fatal condition as it may lead to serious diseases. Therefore tooth brushing is important in children and special attention is needed to be given to those with disabilities. When to start with tooth brushing??? It is important for a parent to highlight the importance of regular tooth brushing and oral care even in young children. Children with Down Syndrome have a great difficulty in tolerating anything being placed in their mouth and tooth brush is no exception. Therefore it is important to introduce tooth brushing at an early stage. Tooth brushing should begin as soon as the child’s first tooth erupts. What can be used for tooth brushing??? Soft cloth. 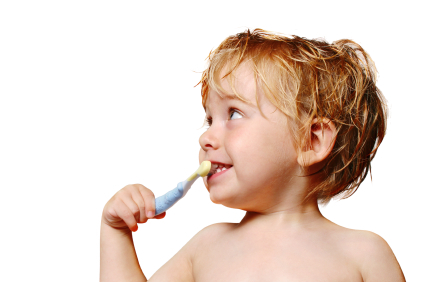 In the beginning, parent can use a soft cloth to brush the gums and graduate to a tooth brush whenever necessary. When using the soft cloth, use a massaging motion. Wet gauze can also be used. Put something sweet on it to give the child extra incentive if needed. When the child gets accustomed to this, start going inside the mouth. Tooth brush. When brushing becomes a routine, start using the tooth brush. If the child doesn’t like the bristle on the brush, just use the other end to desensitize him to the feel of that. Use soft or ultra soft bristle brush. Heat the bristle to soften them if needed. It is important to get the child to that that first step. Stop if you’re gagging him. Pediatric dental tooth brushes are available from a pediatric oral specialist which can be use to ensure proper and effective tooth brushing. Electric tooth brush. As the child gets older, an electric tooth brush can also be introduced for effective tooth brushing. Back teeth. The back teeth seem to be less sensitive than the front ones on most tactile defensive people, so start on the back ones. It’s is important to be patient. Important note : To prevent the child from receiving too much fluoride, a parent should always consult the pediatric dentist. Place.It is important for the child to feel comfortable while tooth brushing. The bathroom isn’t the only place to brush your child’s teeth. Be more creative. Try doing it while the child is in the highchair, or sitting on someone’s lap, or just any other place that you think it might work. Just keep in mind to have all the tooth brushing supplies within your reach. So, do not restrict yourself to one location only. Start early. Children with Down Syndrome has slow learning ability. Therefore it is important to start early. One way to do it is by demonstrating the process on yourself. You might want to think about letting your child watch you brushing your teeth before your child even has any teeth. This will help the child familiarize with tooth brushing little by little. Practice. As they say, practice makes perfect. Before your child has teeth, let your child hold the tooth brush while you’re brushing your teeth. You may try giving him an old tooth brush with something on it to make it taste good and let the child play with it and chew on it before any tooth brushing session. This systematic desensitization program will take several weeks but it is well worth the effort. Reward. Reward can be given after the session is over. Make sure your child does not jam it down the throat . Praise your child exuberantly when the child cooperates. At this young age most kids like pleasing their parents. Routine.Most children with Down Syndrome thrive on routine. Brush your child’s teeth at the same time, in the same place and take notice it is extremely important to use the same routine all the time. If not, the child will be less cooperative which will in turn effect the tooth brushing efficiency. Make it fun.Be creative with your child. Make tooth brushing fun. Make it a game if it helps. Just any game you can think of that will interest your child. Sometimes it helps to give your child a favourite toy to play with while you are brushing. Position.When brushing your child’s teeth, try standing behind. It gives you the advantage of being more in control of her movements and positioning. It also helps in teaching tooth brushing because you are demonstrating the natural position in which it’s done. Make sure your child is seen at least once a year by a dentist. Regular check ups are an important part of maintaining a healthy mouth. This entry was posted in Oral Care, Toothbrushes, Toothpaste and tagged baby teeth, good oral hygiene, oral health, oral hygiene, toothbrush on August 27, 2010 by amelia.